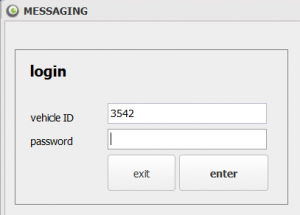 Messaging allows smooth communication between TrackSW and device owners. 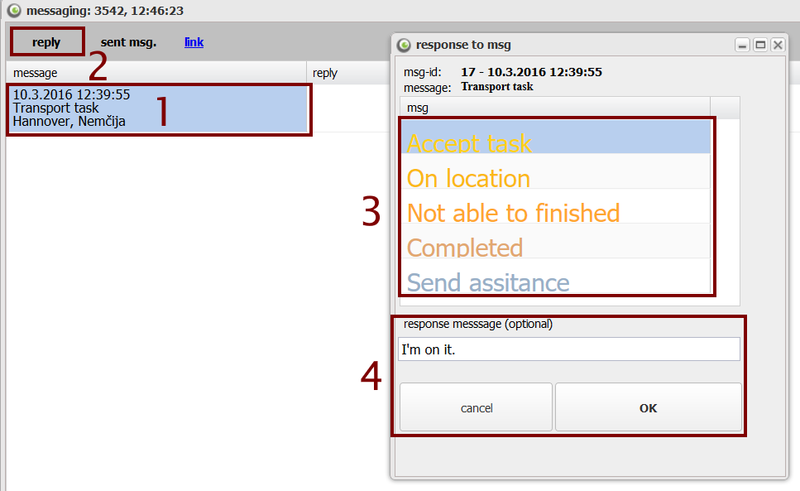 From TrackSW software you can send messages to devices, device owners can read and reply messages from MsgMob web application (http://tracksw.com/MsgMob/). There's also an Android app avaliable for automatic message checking. You can access "Messaging" window by going to current devices (1) and click button messaging (2). A new window will open (3) where you can send and receive messages. Before you start sending messages, you need to do a short set-up. By clicking the button next to "country" field (1), you bring up settings window (2). Here, countries and message statuses can be added and edited. Countries are used when searching for location to send message about. You can add a country by clicking plus button (1), writing a country's name (in english) (2) and save it by clicking on check button (3). 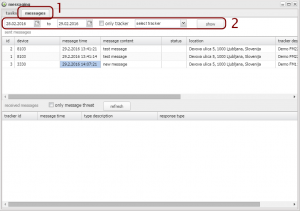 Message statuses are basically type of messages, like "new task", "received", "accepted task", "on location" and similar, and quickly tell the receiver what the message is about. In message config. 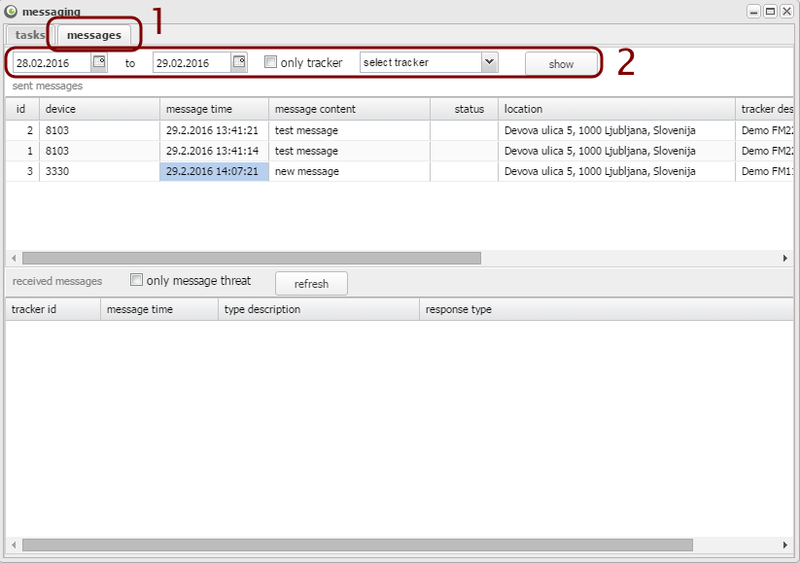 tab (1), you can add a message status by clicking plus button (2) and filling the empty fields. 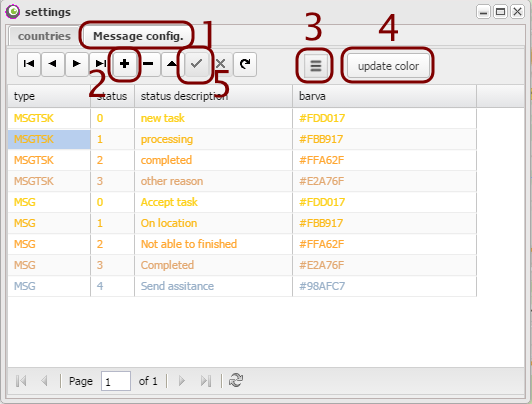 You can select task's color by clicking on menu button (3), select a color and click "update color" button (4). 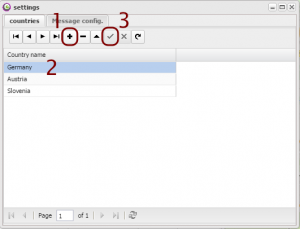 Save changes by clicking on check button (5). Note: There are two types of messages, MSGTSK and MSG. 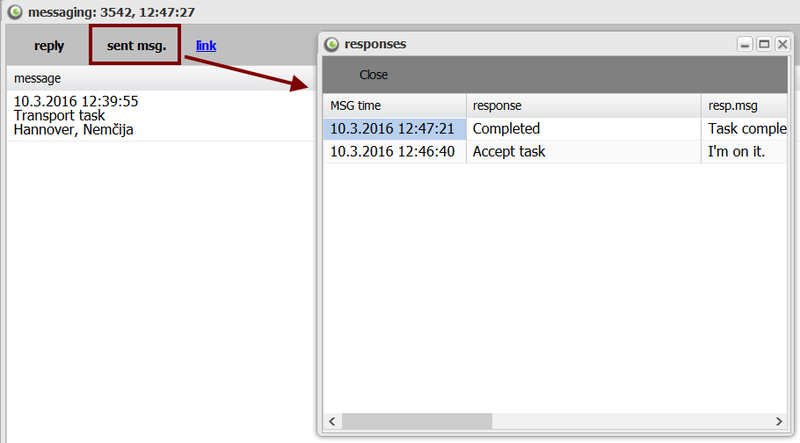 MSGTSK is sent from a task giver (TrackSW software), while MSG type messages can be sent from task receiver back (response). Search for a location and select country. You can check "show on map" and click "search" to see the location on the map (1). Click "set location" to prepare a new message. 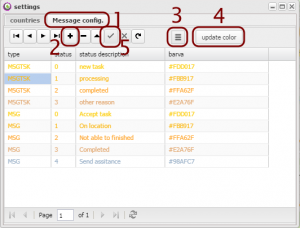 Now, you can add your own task message and select message status (2). Click check button above to save changes. Click button "calculate" (3) - your devices will come up (4) with showing how far each device is from your location. 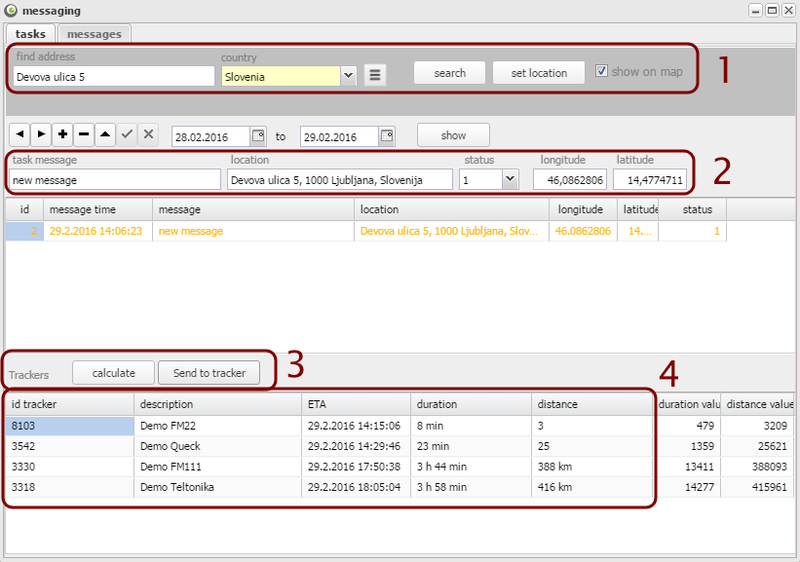 Select the desired device (in most cases, the first - the closest one to the location) and click "Send to tracker" (3). To verify a message was sent you can open up messages tab (1). Your message should pop up on the list. 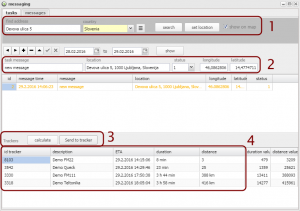 Here, you can also search for all other messages (2) by selecting a date span and/or tracker and clicking button "show". 2. Enter your device ID and password. In the app, you will see a list of received messages (1). Click on a message to select it. To make a reply, click on "reply" button (2). A new window will pop-up, in which you can select a type of reply (3) and add your custom message (4). After you're done, click OK to send an answer. 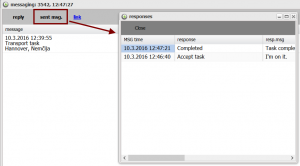 When the task has been processed - completed, you can make a new reply notifying the task completion. 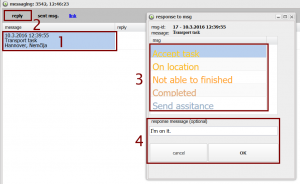 Repeat the same steps as for sending a reply seen above. 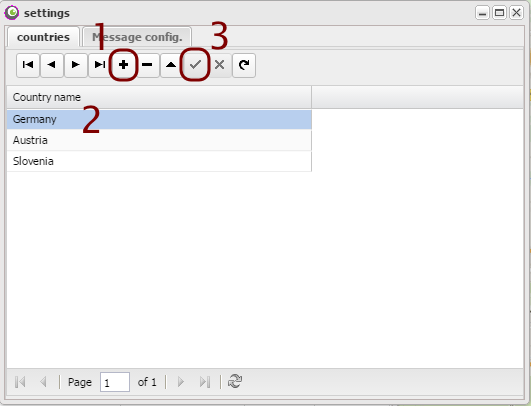 To see a list of send messages, you can click the "send msg." button. A new window will open, showing the replies. Together with a task, a map location is usually sent - you can view the exact location by clicking on "link" that will take you too Google maps - from there, you can easily set up the navigation to lead you there.